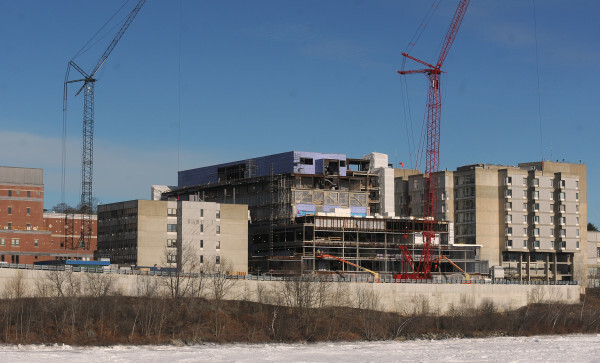 Ongoing construction at the Eastern Maine Medical Center in Bangor Thursday, Jan. 22, 2015. Doctors, nurses and other hospital workers don’t get snow days. As a potentially record-breaking blizzard bore down Monday on Maine, the state’s medical centers stocked up on life-saving supplies, arranged hotel rooms for staff facing long hours and touched base with their plow truck drivers. Joel Farley, head of emergency preparedness for Eastern Maine Medical Center in Bangor, spoke for many Mainers in summing up the hospital’s response. First on his to-do list was maintaining the safety of patients, staff and the community, he said. That’s true no matter what Mother Nature has in store. “We’re open 24-7-365, so we always have to maintain capability, whether it’s the middle of July or a big snowstorm in January,” Farley said. To keep the lights on, EMMC will rely on its combined heat and power cogeneration plant, which the hospital installed after temporarily losing power during the ice storm of 1998. The natural gas-powered system, which generates steam and up to 5 megawatts of electricity, shouldn’t face any fuel interruptions, but the hospital can tap into 33,000 gallons of diesel fuel to burn just in case, Farley said. Most of EMMC’s regular operations will continue, although the LifeFlight helicopter will be grounded Tuesday and Cancer Care of Maine in Brewer plans to close, he said. EMMC’s walk-in clinic on Union Street and physician practices will remain open, and patients expecting to miss their appointments are asked to call ahead, Farley said. Both EMMC and Maine Medical Center in Portland plan to staff their emergency rooms as usual throughout the blizzard. “Historically we don’t see a huge uptick in patients, we see a change in the types of injuries,” said Joshua Frances, director of emergency preparedness at MMC. Patients tend to show up with back problems from shoveling and injuries from slips and falls during a big storm, he said. Many members of the hospital’s medical staff will arrive at work ahead of the storm, ready to remain for the duration, Frances said. The hospital made provisions for some employees to stay the night at local hotels and beefed up food services to keep them fed, he said. Many will be tending to patients while their loved ones hunker down at home. Every September — recognized as National Preparedness Month — MMC encourages staff to get ready for inclement weather, such as by storing extra food and water, Frances said. “They’re less worried about their families and what’s happening at the house and they’re able to come and perform their job duties,” he said. MMC activated its emergency operations plan Monday morning, preparing for a three-day event. “The biggest thing is patient care and keeping continuity of operations going,” Frances said. With deliveries from the hospital’s warehouse expected to be delayed, MMC received a special order of supplies on site, including everything from oxygen and surgical equipment to toilet paper, he said. Along with the hospitals, ambulance drivers will be ready to respond throughout the storm, Farley said. “They don’t take a day off because it snows,” he said.